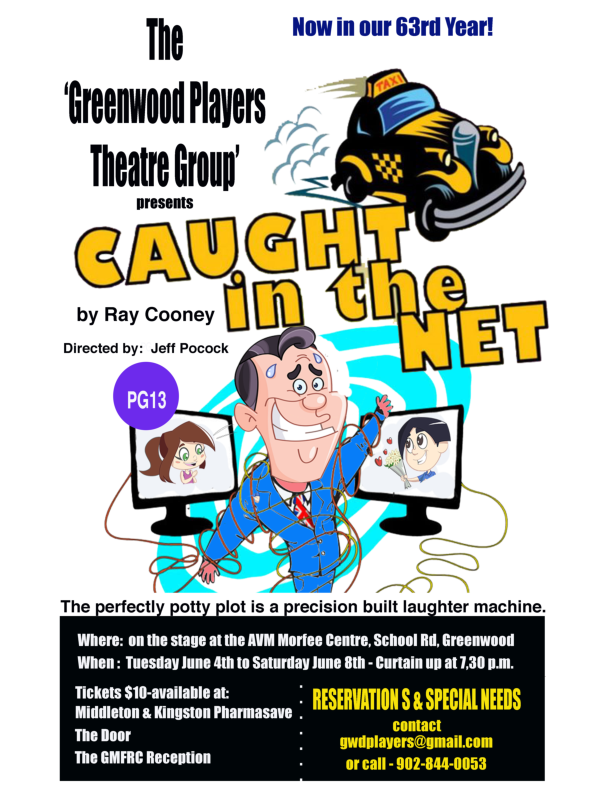 The Greenwood Players are once again caught up in rehearsals for their Spring production of Ray Cooney’s “Caught in the Net”’ a sequel to “Run for Your Wife”, performed by the Players in 1988. “Caught in the Net” finds bigamist John Smith, an unassuming, hard working London taxi driver, still trying to keep his two families apart in different parts of London; Wimbledon and Streatham. Both spouses and children are blissfully unaware of each other until his teenage son with wife, Barbara, and his daughter with wife, Mary, meet on the internet. Teenagers Gavin and Vicki discover that they have so much in common, taxi driving father, same surname and age, that they want to meet in person. Keeping the teens apart plunges John into a whirlpool of hilarious improvisations and deceit. John’s lodger and oldest friend, Stanley, could be a savior but he is about to go on holiday with his decrepit old mum, who only adds to the mayhem. As John struggles to hide the truth, the situation spirals out of control leaving him to juggle the outrageous truth! Director, Jeffery Pocock, a veteran in the theatrical world, has brought together a stellar cast of new and returning Greenwood Players thespians to mount this funny, irreverent play. The role of taxi driver, John Smith, is played ably by, Mike Cook, with his wives Barbara and Mary being expertly handled by Carolyn Coloumbe and Bleu Rae, respectively. Recent additions to the Greenwood Players arsenal, Bliss Om Rae and Lexie Key play the lovelorn teenagers, Gavin and Vicki. Ryan Herbert and Nicole Rigby, round off this great cast as Stanley and his mum. Will John succeed in keeping his secret safe or will his dual lives be exposed? Will Stanley’s mother accept than she is not on holiday and will Gavin and Vicki ever meet face to face? For reservations please contact gwdplayers@gmail.com, or 902-844-0053, leave a voicemail. Middleton and Kingston Pharmasaves, the MFRC in the AVM Morfee.